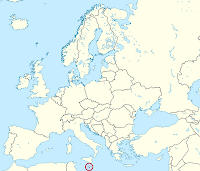 The Maltese archipelago lies virtually at the centre of the Mediterranean Sea, with Malta 93 km south of Sicily and 288 km north of Africa. The archipelago consists of three islands: Malta, Gozo and Comino. Malta is the largest island and the cultural, commercial and administrative centre. 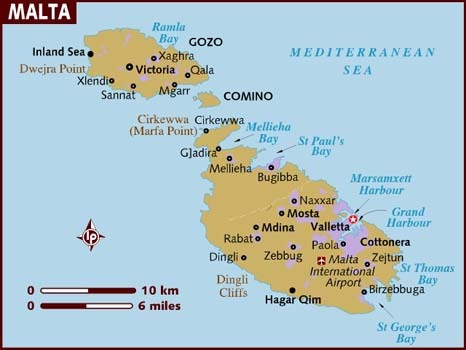 Gozo is the second largest island and is more rural, characterised by fishing, tourism, crafts and agriculture while Comino is largely uninhabited. 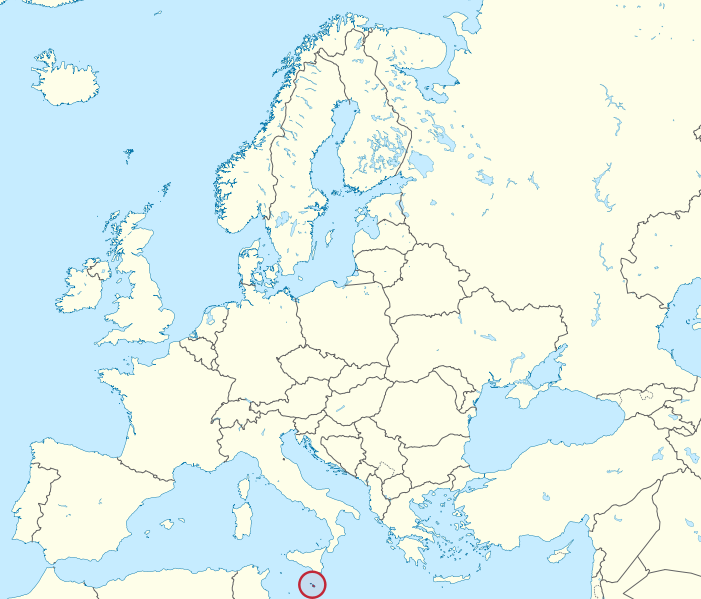 The capital city of Malta is Valetta. With superbly sunny weather, expansive beaches and 7,000 years of intriguing history, there is a great deal to see and do. Captivating places of interest are easily reachable within a small space – the world famous Hypogeum selected as a place of World Heritage by UNESCO, the Ghadira wetland, prehistoric temples and grand palaces are but a few. The narrow meandering streets of Malta’s towns and villages are crowded with Renaissance cathedrals and Baroque palaces. As the countryside is dotted with the oldest known human structures in the world, the Islands have rightly been described as an open-air museum. 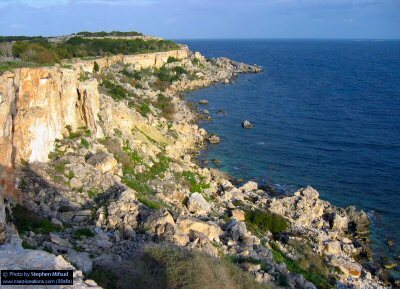 Malta's most significant environmental problems include inadequate water supply, deforestation, and the preservation of its wildlife. The number of motor vehicles per person remains very high, leading to road crashes, air pollution and noise. Concentrations of particulate matter and ozone levels are still high. Electricity generation largely requires the combustion of fossil fuels, contributing significantly to the existing problems. However, power stations began to use low-sulfur fuels in 2003. The country's extremely limited fresh water resources have led to increasing dependence on desalination. The nation's agriculture suffers from lack of adequate water for crops due to limited rainfall. Malta was one of the first countries to ratify the 1976 Barcelona Convention for the protection of the Mediterranean from pollution. A significant proportion of Malta's animal and plant life is in danger of extinction. The slaughter of migratory birds on migration during unregulated hunting is also a problem. Endangered species include the slender-billed curlew, Mediterranean monk seal, hawksbill turtle, and Atlantic ridley. Across the Mediterranean region, climate change is expected to add to existing environmental problems, such as desertification, water scarcity and food production, while also introducing new threats to human health, ecosystems and national economies of countries. Among the climate change impacts expected for Malta are drought, salinization of land, increased risk of forest fires, soil erosion, and a loss of freshwater resources, including reductions in water availability. According to the Second European Quality of Life Survey performed by European Foundation for the Improvement of Living and Working Conditions, in Malta the participation rate in voluntary and charitable activities averages between 10% and 15%, one of the lowest rates in the EU. Overall, people in Malta are likely to participate in voluntary work less frequently. However, a Maltese person is significantly less likely to believe that the amount of time they allocate to voluntary work or political activities is just right. Environmental taxes are relatively high (Malta 3.3 % of GDP, EU-27 2.6 % of GDP). The high level of environmental tax revenue is attributable to taxation on transport, which is the highest in the Union (1.6 % of GDP, EU-27 0.6 %), while revenue from taxation on energy is somewhat below the EU average (1.5 %, EU-27 1.9 %). In September 2004 the so-called eco-contribution was introduced in Malta mainly to finance the development of a waste water management system. It is chargeable on a number of white goods, containers, batteries, plastic bags, tyres and other specified products that are deemed to result in waste. Currently taxes on pollution yield 0.2 % of GDP, which is the fourth highest level in the EU. From 2011, registration taxes of commercial vehicles up to Euro Standard 3 have been increased in order to encourage the newer and cleaner vehicles. Companies can also benefit from a reduction in company tax up to 125 % on the amounts spent on electric cars. An excise duty was introduced on every tonne of cement. Increasingly, corporate social responsibility is evolving beyond philanthropy to an essential business function directly related to companies maintaining their social license to operate. Companies' corporate social responsibility may take various forms and may be carried out through various institutes. The Maltese foundation, when set up as a voluntary organization, provides an ideal vehicle for corporate social responsibility. In recent years the Maltese legislature has responded to the growing social consciousness of both companies and individuals, and has created a framework for voluntary organizations. A number of businesses have already recognized that a Maltese foundation is an ideal vehicle for corporate social responsibility and have chosen to establish a foundation in Malta in order to promote public interest. The Maltese voluntary sector is fully equipped for use as a platform for corporate social responsibility. The government has placed considerable importance on the development of the voluntary sector. The national action plan aims to aid and encourage the sector to continue increasing its effectiveness and efficiency, and ultimately to deliver on its goals.